Wellness is a modern word with ancient roots. 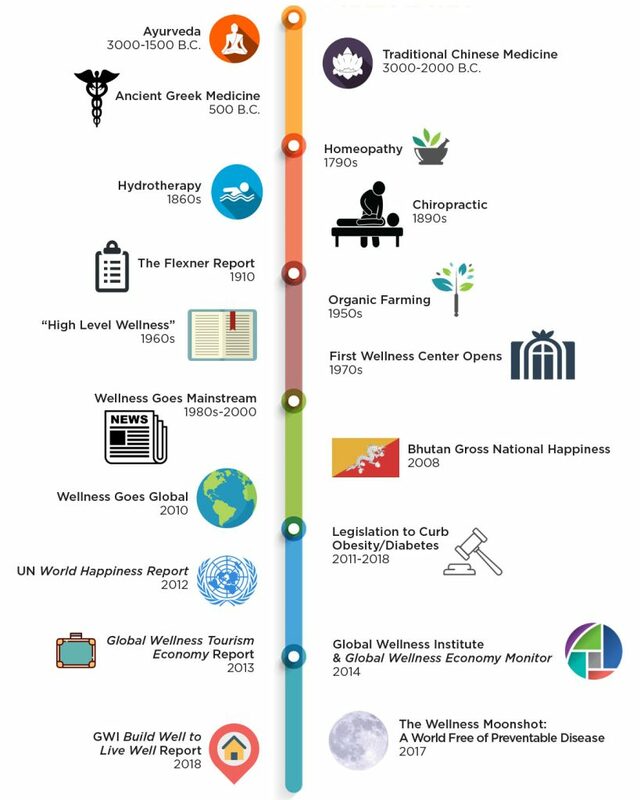 As a modern concept, wellness has gained currency since the 1950s, 1960s and 1970s, when the writings and leadership of an informal network of physicians and thinkers in the United States largely shaped the way we conceptualize and talk about wellness today. The origins of wellness, however, are far older – even ancient. Aspects of the wellness concept are firmly rooted in several intellectual, religious, and medical movements in the United States and Europe in the 19th century. The tenets of wellness can also be traced to the ancient civilizations of Greece, Rome and Asia, whose historical traditions have indelibly influenced the modern wellness movement. 3,000-1,500 BC: Ayurveda – originated as an oral tradition, later recorded in the Vedas, four sacred Hindu texts. A holistic system that strives to create harmony between body, mind and spirit, Ayurvedic regimens are tailored to each person’s unique consitution (their nutritional, exercise, social interaction and hygiene needs) – with the goal of maintaining a balance that prevents illness. Yoga and meditation are critical to the tradition, and are, of course, increasingly practiced worldwide. 3,000 – 2,000 BC: Traditional Chinese Medicine (TCM), one of the world’s oldest systems of medicine, develops. Influenced by Taoism and Buddhism, TCM applies a holistic perspective to achieving health and wellbeing, by cultivating harmony in one’s life. Approaches that evolved out of TCM, such as acupuncture, herbal medicine, qi gong and tai chi, have become core, modern wellness – and even Western medical – approaches. 500 BC: Ancient Greek physician Hippocrates – is possibly the first physician to focus on preventing sickness instead of simply treating disease, and also argued that disease is a product of diet, lifestyle and environmental factors. 50 BC: Ancient Roman medicine emphasized disease prevention, adopting the Greek belief that illness was a product of diet and lifestyle. Ancient Rome’s highly developed public health system (with its extensive system of aqueducts, sewers and public baths) helped prevent the spreading of germs and maintained a healthier population. In the 19th century new intellectual movements, spiritual philosophies and medical practices proliferated in the United States and Europe. A number of alternative healthcare methods that focus on self-healing, holistic approaches, and preventive care – including homeopathy, osteopathy, chiropractic, and naturopathy – were founded during this era and gained widespread popularity in both Europe and the United States. Other new philosophies were more spiritually oriented (such as the “mind-cure movements,” including New Thought and Christian Science) and were instrumental in propagating the modern idea that a primary source of physical health is one’s mental and spiritual state of being. While some of the beliefs espoused by the thinkers behind these movements have been discredited, or seem “wacky” today, these movements did popularize ideas about regaining or maintaining one’s health through diet, exercise and other lifestyle measures. The philosophies embodied in these 19th century systems – that a healthy body is a product of a healthy mind and spirit – are now considered precursors to the current, thriving wellness and self-help movements. In addition, although these approaches fell out of favor with the rise of modern, evidence-based medicine in the mid-20th century, several of them are now regaining favor within the mainstream medical community and the general public. 1790s: German physician Christian Hahneman develops Homeopathy, a system that uses natural substances to promote the body’s self-healing response. 1860s: German priest Sebastian Kneipp promotes his “Kneipp Cure”, combining hydrotherapy with herbalism, exercise and nutrition. The New Thought movement also emerges, around Phineas Quimby’s theories of mentally-aided healing. 1870s: Mary Baker Eddy founds spiritual-healing-based Christian Science. Andrew Taylor Still develops Osteopathy, a holistic approach grounded in manipulating muscles and joints. 1880s: Swiss physician Maximilian Bircher-Benner pioneers nutritional research, advocating a balanced diet of fruits and vegetables. The YMCA launches as one of the world’s first wellness organizations, with its principle of developing mind, body and spirit. 1890s: Daniel David Palmer develops Chiropractic, focused on the body’s structure and functioning. 1900s: John Harvey Kellogg (director of the Battle Creek, Michigan Sanitorium) espouses a healthy diet, exercise, fresh air, hydotherapy and “learning to stay well.” Naturopathy, focused on the body’s ability to heal itself through dietary and lifestyle change, herbs, massage and joint manipulation, also spreads to the U.S. from Europe. Austrian philosopher Rudolf Steiner develops the spiritual movement of anthrosophy and the holistic system of anthrosophical medicine. Another Austrian, F.X. Mayr, develops “Mayr Therapy”, a detoxification and dietary modification program. 1910: The Carnegie Foundation’s Flexner Report, a critique of North America’s medical education system for lack of standards and scientific rigor, questions the validity of all forms of medicine other than biomedicine, resulting in most alternative systems (homeopathy, naturopathy, etc.) being dropped from mainstream medical education, and setting the stage for our modern disease-oriented, evidence-based medicine. Our modern use of the word “wellness” dates to the 1950s and a seminal – but little known – work by physician Halbert L. Dunn, called High-Level Wellness (published1961). Although Dunn’s work received little attention initially, his ideas were later embraced in the 1970s by an informal network of individuals in the U.S., including Dr. John Travis, Don Ardell, Dr. Bill Hettler, and others. These “fathers of the wellness movement” created their own comprehensive models of wellness, developed new wellness assessment tools, and wrote and spoke actively on the concept. Travis, Ardell, Hettler and their associates were responsible for creating the world’s first wellness center, developing the first university campus wellness center, and establishing the National Wellness Institute and National Wellness Conference in the U.S.
From 1980-2000, the wellness movement begins to gain momentum, and get taken more seriously by the medical, academic and corporate worlds. For instance, Hettler’s National Wellness Institute caught the attention of Tom Dickey and Rodney Friedman, who then established the monthly Berkeley Wellness Letter (1984), designed to compete with the Harvard Medical School Health Letter, pointedly using “wellness” in the title as contrast. This influential academic publication presented evidence-based articles on wellness approaches, while also debunking numerous health fads. More medical establishment validation: in 1991 the U.S. National Center for Complementary and Alternative Medicine (NCCAM) was established, as part of the government-funded National Institutes of Health. More government-sponsored programs to promote healthier lifestyles launched in U.S. cities/states. The modern concept of wellness also spread to Europe, where the German Wellness Association (Deutscher Wellness Verband, DWV) and the European Wellness Union (Europäischen Wellness Union, EWU) were founded in 1990. 1950s: J.I. Rodale, one the first advocates for organic farming in the U.S., launches Prevention magazine, a pioneering publication in promoting alternative/preventative health. 1950s-1960s: Physician Halbert L. Dunn presents his idea of “high level wellness” in 29 lectures, and then publishes these ideas in his influential book by the same title. 1970s: Dr. John Travis, influenced by Dunn, opens the world’s first wellness center in California, and publishes a 12-dimension wellness assessment tool, The Wellness Inventory (1975) and The Wellness Workbook (1977) – the latter both in use today. Don Ardell publishes High Level Wellness: An Alternative to Doctors, Drugs and Disease (1977, referencing Dunn’s work). The University of Wisconsin-Stevens Point (UWSP), drawing on Travis’ materials, establishes the first university campus wellness center, with campus wellness centers spreading throughout the U.S. in the 80s. In ’77-’78, Dr. Bill Hettler of USWP organizes the National Wellness Institute and first National Wellness Conference. 1980s-2000s: Workplace wellness programs, the fitness and spa industries, and celebrity wellness and self-help experts take off – bringing wellness into the mainstream. A 2010 New York Times article on the word/concept of wellness noted that when Dan Rather did a 60 Minutes segment on the topic in 1979, he intoned, “Wellness, there’s a word you don’t hear everyday.” But “…more than three decades later,” the NYT noted, “wellness is, in fact, a word that Americans might hear every day…” And it’s more than Americans paying attention to wellness. In the 21st century, the global wellness movement and market reached a dramatic tipping point: fitness, diet, healthy living and wellbeing concepts and offerings have proliferated wildly—and a concept of wellness is transforming every industry from food and beverage to travel. By 2014, more than half of global employers were using health promotion strategies, while a third have invested in full-blown wellness programs (Bucks Consultants report). Medical and self-help experts who promote wellness (such as Drs. Mehmet Oz, Deepak Chopra and Andrew Weil) became household names. “Wellness,” essentially, entered the collective world psyche and vocabulary and is firmly entrenched with the media and an increasing number of medical institutions and governments. With a chronic disease and obesity crisis raging worldwide in this century, leading to unsustainable healthcare costs, the traditional medical establishment and more governments are shifting the focus to prevention and wellness. For instance, if, in the 1990s, most academic medical centers had an adversarial stance toward complementary medicine, now many of the most elite institutions in the world feature Integrative Medicine departments. For example, in 1999, in the US, eight medical institutions (including Harvard and Stanford) convened at a historic conference, The Consortium of Academic Health Centers for Integrative Medicine. Today, membership spans 60 esteemed institutions such as Yale, Harvard and the Mayo Clinic. In Europe, respected, large institutions, such as Charité University Medical Center (Berlin), the Karolinska Institute (Stockholm), and the Royal London Hospital, have large Integrative Medicine centers. And again, in the US, fast-growing federal and foundation research funds (close to $250 million annually just from NCCAM and the National Cancer Institute) are dedicated to research on complementary medicine, wellness and prevention. The American Board of Physician Specialties, which awards board certification to medical doctors, announced that, in 2014, it would begin accrediting doctors in Integrative Medicine. 2011-2018: With obesity and diabetes skyrocketing, from 2011–2018, there was a flurry of new laws taxing soda/sugary drinks in nations across the world. A few examples with dates of legislation: Finland 2011, Hungary 2011, France 2012, Mexico 2014, Chile 2014, UK 2016–2018, UAE 2017, Portugal 2017, Saudi Arabia 2017, Sri Lanka 2017, Ireland 2018, and South Africa 2018. Norway bumped up sugar taxes in 2018, and US cities, such as Berkeley, CA; Oakland, CA; Boulder, CO; Philadelphia, PA; and Seattle, WA, all passed new soda tax laws. 2012: On April 1, 2012, the first World Happiness Report was released, now an annual publication of the United Nations Sustainable Development Solutions Network. The groundbreaking report, used data from the Gallup World Poll and measured the state of happiness in 155 nations, the key causes of happiness and misery, and policy implications for countries worldwide. 2014: The Global Wellness Institute (GWI) launched and released research finding that the global wellness industry was a $3.4 trillion market or 3.4 times larger than the worldwide pharmaceutical industry. The GWI research also benchmarked the 10 sectors comprising the global wellness market: Beauty & Anti-Aging ($1.03 trillion), Healthy Eating/Nutrition/Weight Loss ($574 billion), Fitness & Mind-Body ($446 billion), Wellness Tourism ($494 billion), Preventative/Personalized Health ($433 billion), Complementary/Alternative Medicine ($187 billion), Wellness Lifestyle Real Estate ($100 billion), Spa Industry ($94 billion), Thermal/Mineral Springs ($50 billion), and Workplace Wellness ($41 billion). 2017: In October, the GWI, along with Dr. Richard H. Carmona, 17th Surgeon General of the United States, announced The Wellness Moonshot: A World Free of Preventable Disease; a call to action to eradicate chronic, avoidable disease worldwide by uniting the health and wellness industries. 2018: In January, the Global Wellness Institute released Build Well to Live Well, the first in-depth research to analyze the $134 billion global wellness real estate and communities sector. The report found that real estate and communities that intentionally put people’s health at the center of design, creation and redevelopment are the next frontiers in real estate. On June 9, the sixth-annual Global Wellness Day, which is considered the first day dedicated to living well, took place. It was celebrated in more than 100 countries at 5,000 different locations. In October, the GWI released an updated Global Wellness Economy Monitor, finding that the world wellness economy grew from a $3.7 trillion market in 2015 to $4.2 trillion in 2017—growing nearly twice the rate of the global economy (3.6 percent annually). The report stated that wellness expenditures are now more than half as large as total global health expenditures ($7.3 trillion), and the wellness industry represents 5.3 percent of global economic output. In November, the GWI released an updated Global Wellness Tourism Economy Monitor, finding that wellness tourism grew from a $563 billion market in 2015 to $639 billion in 2017, or 6.5 percent annually, more than twice as fast as tourism overall (3.2 percent). And in the report, wellness tourism is forecast to grow even faster through 2022 (7.5 percent yearly) to reach $919 billion. 2019: In January, The Wellness Moonshot Calendar: A Year of Inspiration was launched in support of The Wellness Moonshot: A World Free of Preventable Disease.